This statement perfectly embodies one of the main concerns surrounding water fluoridation, the unethical practise of mass medicating an entire population. The lack of informed consent is violating individual human rights. These rights are also one of the key reasons as to why China, India, Japan and the majority of Europe no longer provides fluoridated tap water. As people one of the only things we can physically control is what we do or do not put into our bodies. By manipulating a basic need which everyone requires yet not everyone can avoid, the government is taking away that right. In order to fully avoid ingesting high levels of fluoride one must drink un-fluoridated bottled water or install an osmosis filter for drinking and cooking. Both of these methods are expensive in the long run and are especially unobtainable for those who are destitute. Food and drinks from restaurants and cafes must also be avoided. All of these factors make avoiding fluoride near to impossible and make the subject of adding fluoride to public water supplies a matter of inequality rather than equality for the population. The U.S. food and drug administration (FDA) has classified fluoride as a drug. Drugs are prescribed to suit the requirements of the individual and not slipped into the waterways in the hope that everyone is getting the right dose and that it is indeed having the desired effect. We are in effect patients to a masked doctor, who we have never met and who does not know our medical history. Fluoride is the only drug administered without consent over a large population. The idea behind adding fluoride a known drug into tap water is sold to the public from the mouth of the government and dentists. They do this by describing fluoride as beneficial to all socio-economic groups in fighting tooth decay. Because the general public sees no reason to argue what has been publicly advertised as beneficial to them, by authority figures, they are effectively being deceived. Ministry of health and fluoridated tap water. On their website The NZ ministry of health recommends “the adjustment of fluoride to between 0.7 and 1.0 parts per million in drinking water as the most effective and efficient way of preventing dental caries in communities”. Fluoride is measured in milligrams per litre (mg/litre). So if someone drinks 1 litre of fluoridated tap water they receive 1 mg of fluoride and if they drink 2 litres of fluoridated tap water they receive 2mg of fluoride. This brings the crucial factor of dose versus dosage into play. As the quantity of fluoride ingested increases so does it’s concentration. In the case of athletes and labourers who may be consuming larger quantities of tap water and therefore receiving higher dosages, fluoride’s side effects will be more prevalent. Similarly the negative effect fluoride has on the body is magnified for the vulnerable, such as the old, the very young and the ailing. The NZ Ministry of health even admits to this obvious flaw by stating that “because of the uncertainty of knowing how much fluoride is actually absorbed from the diet, definitive statements cannot be made about the real contribution of dietary fluoride to the total intake”. The Ministry of Health’s main concern should be the general health of the population. So how can they simply ignore the reality of fluoride being administered without control over the dosage for the population, while disregarding the needs of the individual. The government’s inaction shows that it is easier for them to say that fluoride is having the desired effect rather than to admit their flaws and monitor the situation. In the case of fluoride which is known to be a highly toxic substance at moderate to high doses, we cannot afford to just dismiss this point. Dosage can definitely not be dismissed in the case of infants receiving baby formula made with fluoridated water, according to http://www.fluoridealert.org/issues/infant-exposure/ “Due to their small size, infants receive up to 400% more fluoride (per pound of body weight) than adults consuming the same level of fluoride in water”. Infants are not able to excrete as much fluoride as adults and therefore suffer from high rates of dental fluorosis. The government is seemingly making access to fluoride equal to all socioeconomic communities and selling this as an attraction rather than a weakness. In turn by sweeping the entire population under one hat the government is in effect doing more harm than good. Fluoridated tap water and it’s suspicious nature. To analyse what has driven fluoride to remain in tap water we must first evaluate the suspicious nature of adding fluoride to public water supplies. As stated in the case against fluoride written by PhD holder Paul Connett “only 0.54 percent of water suitable for drinking is used as such”. The other 99.46% of fluoridated tap water is used for taking a shower, flushing the toilet, doing the dishes, washing the car, watering the garden and running the washing machine. This is completely uneconomical. What does the government have to gain from spending money on fluoridating our water, when most of it gets poured down the drain or absorbed into the soil? Jacques Barzum historian at Columbia university wrote on this matter in 1964 “One hopes behind the fluoride scheme there are politics and selfish business interests; the presence of solid ulterior motives would restore one’s faith in common intelligence”. Are we being feed a lie, which when left unquestioned has the potential to jeopardise our future wellbeing? Health authorities in the United States call water fluoridation one of the “top ten public health achievements of the 20th century”. By revoking this publicised statement authority figures face to lose credibility, but by reinforcing that fluoride is safe and effective the reputations of people who have been supporting the practise for years are being defended. They can’t change their vote now, they are in too deep and therefore supporting the lie which is fluoridated tap water seems to be the only option for authorities. 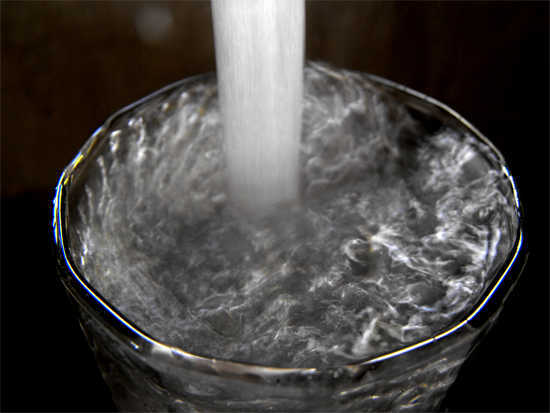 Want to know more about fluoridated tap water?